Not my scan. Please, credit Ju-Ni for this. Poor Byakuya was so belligerent as a child. 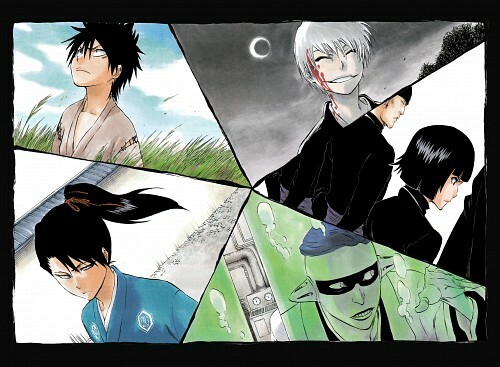 Young Gin just kinda scares me. ooh. i didn't realise that that was young byakuya. yeah. he looks so cute! anyways, who's the one on the top left hand corner? is that shuuhei? and is the one below Gin and above mayuri, soifon? I already had this but the larger the better XD. Byakuya and Shuu look so cute in this picture. And Gin! I love his sadistic grim XD. (scream) Byakuya very cute! ,Gin Kawaii too. this picture is opening chapter, right? Byakuya as a stubborn little kid is too cute. Shuuhei and Byakuya as kids! oh man does anyone have this picture without the text?